Webster Groves is known for its eclectic range of housing styles and beautiful streets. This wonderful ranch is located on a premier street with an oversized heavily tree'd lot that is completely flat. The location is only a few minutes from schools, parks, highways & shopping. Get anywhere in STL in 15 minutes! 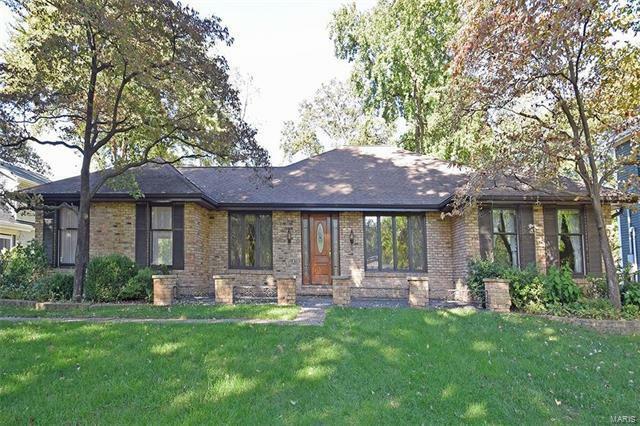 This 4 Bedroom Ranch has 4 sides of brick, spacious rooms, and an attached 2 car garage. You'll enter to a central foyer flanked by a huge Living Room and nicely proportioned dining room. Straight ahead is the Family Room with built-in shelving & a masonry Fireplace and a very convenient WET BAR. The kitchen to the left is recently updated with GRANITE TOPS, updated appliances & a breakfast room large enough for any family. One of the many advantages of this style home is the expansive lower level. Here is a full foot-print blank slate just waiting for your personal finishes. All this at a very affordable price designed to move it quickly and allow a new owner to build equity. Laclede Station Rd, South of Hwy 44, to Hurstgreen Rd and turn Right. House on the Right.